Jeff & Emily Silva first heard about Porcupine Real Estate on the Northeast Shooters forums. As residents of Massachusetts, they knew they wanted to move to New Hampshire for the lifestyle, beauty and affordability of the state. With Jeff's job as a sign maker at Seaport Signworks in Newburyport, and family still in Massachusetts, the couple decided to look for homes in Rockingham county. They ultimately found a home in Nottingham, and they love the small-town vibe of this town with a population of 5,000. Jeff & Emily are enjoying the relaxed, stress-free pace and don't miss the traffic or noise of their previous home: "We've just about settled in here and I have to say, we love it! The peace, the quiet, the friendly people. It's just fantastic. 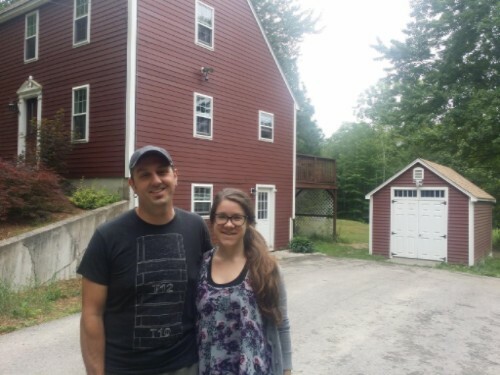 Making our home in NH was a great decision and one that we'll enjoy for a long time." Welcome home, Jeff & Emily!